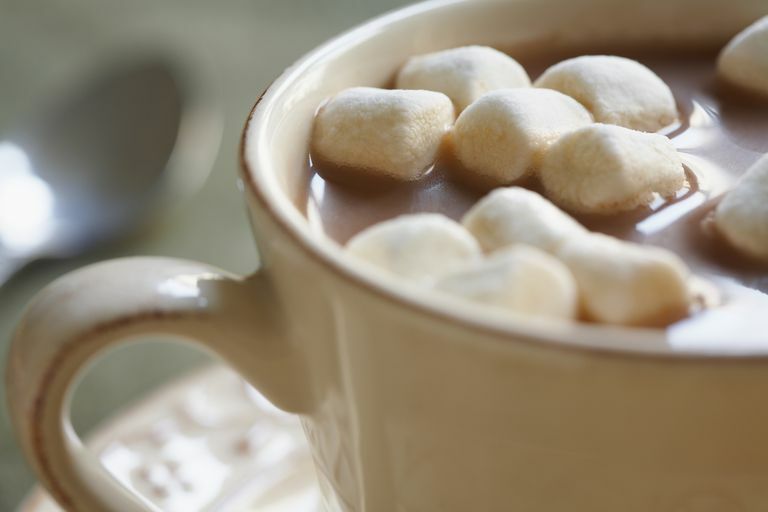 Winter brings thoughts of sitting in front of a roaring fire and sipping hot chocolate or hot cocoa, preferably with gluten-free marshmallows. But which of the store-bought hot chocolate mixes (made with actual chocolate) and hot cocoa mixes (made with cocoa powder, not chocolate) are considered gluten-free? Finally, there are multiple additional hot chocolate and hot cocoa mixes that contain no gluten ingredients but that aren't considered safely gluten-free by their manufacturers due to potential gluten cross-contamination, plus three brands to avoid altogether. BariWise High Protein Hot Cocoa. This brand produces products that are specially formulated for the needs of people who have undergone bariatric surgery. BariWise offers two flavors of hot cocoa: chocolate, and chocolate with marshmallows. Both contain around 15g of protein per package and are gluten-free, aspartame-free, saturated-fat free, and low cholesterol. Hershey's. Hershey's Cocoa, Hershey's Special Dark Cocoa, and Hershey's Dutch Cocoa all appear on the company's gluten-free list. Hershey's tests its gluten-free products to less than 20 parts per million). Note that even though Special Dark cocoa is considered gluten-free, Special Dark chocolate bars are not gluten-free (for more information, see the Gluten-Free Candy List). Hershey's gluten-free list can be very confusing, so always double-check what you're buying. In Joy Organics. This smaller company makes three flavors of hot cocoa: chocolate, chocolate mint, and chocolate orange. All are low-calorie (about 15 calories a serving) and sweetened by erythritol (a natural sugar alcohol) and stevia (a natural sugar substitute). The mixes contain xanthan gum (a common gluten-free ingredient). Mrs. Bryant's Dutch Colony. Mrs. Bryant's Dutch Colony makes only one flavor of hot cocoa, and the product contains just three ingredients: cocoa, sugar, and natural flavors. The cocoa is gluten-free, vegan, and Kosher, according to the company. Swiss Miss. Swiss Miss may be the best-known hot chocolate mix, and the company makes a wide variety of different flavors, including Diet and No Sugar Added varieties. All are considered legally gluten-free and carry "gluten-free" designations on their labels. Swiss Miss is a ConAgra company, and ConAgra has a policy of clearly disclosing all gluten-containing ingredients on the label, including those from barley and rye. Swiss Miss also makes Keurig K-Cups for hot cocoa, which are considered gluten-free as well. V!VA Caffeinated Hot Chocolate. If you want your hot chocolate with a little kick, you may want to try V!VA's hot chocolate, which is infused with 100mg of caffeine (about two-thirds the amount of caffeine in a typical 16 oz. latte). All V!VA caffeinated products are gluten-free, according to the company. These brands don't use gluten ingredients in their hot chocolate and hot cocoa formulations, but the products aren't specifically listed as "gluten-free," and may be subject to gluten cross-contamination. Equal Exchange Hot Cocoa. Equal Exchange, a fair trade, organic company, offers three different hot cocoa and hot chocolate products: Dark Hot Chocolate Mix, Hot Cocoa Mix, and Spicy Hot Cocoa Mix. None contain gluten ingredients. However, both the Hot Cocoa Mix and the Spicy Hot Cocoa mix are manufactured on equipment that also processes wheat ingredients, according to a company statement. Therefore, if you want to enjoy a cup of Equal Exchange hot chocolate, opt for the Dark Hot Chocolate, and skip the two hot cocoa mixes. Ghiradelli. This San Francisco-based company makes hot cocoa in four flavors: Double Chocolate, Chocolate Mocha, Chocolate Caramel, and Hot Cocoa with Chocolate Chips. Only one Ghiradelli product—the company's Luxe Milk Crisp bars—contains a gluten ingredient (barley malt). That product is not made on the same equipment as the powdered mixes. However, Ghiradelli does not test for gluten and does not maintain a gluten-free list, so the company advises caution with all Ghiradelli products, including hot cocoa. Keurig Cafe Escapes. This brand has no gluten ingredients but isn't specifically considered gluten-free. Therefore, if you're looking for a K-Cup hot chocolate, stick with Swiss Miss. Land O Lakes. Cocoa Classics, distributed by Land O Lakes, is available in 12 different flavors. Land O Lakes maintains a short gluten-free list that does not include its Cocoa Classics products. The company states that it will provide "complete and accurate ingredient information" on its labels. None of the 12 Cocoa Classics products contain gluten ingredients, but the company does not test them for gluten cross-contamination. Nestle. This ubiquitous hot cocoa brand comes in three varieties: Classic, Classic with Mini Marshmallows, and Fat-Free. Unfortunately, Nestle does not label any of its hot cocoas gluten-free, since the products may be processed on equipment that also processes wheat-containing ingredients. Trader Joe's. The quirky grocery store chain used to include T.J.'s Sipping Chocolate on its list of "no gluten ingredient" products, but the hot chocolate doesn't appear on the chain's current "gluten-free" list, so I'd steer clear. Stephens Gourmet Hot Cocoa. Stephens offers a variety of interesting flavors, including Mint Truffle Cocoa, English Toffee Cocoa, and Candycane Cocoa. Unfortunately, several of the company's innovative flavors contain wheat (in the form of cookies) or barley (in the form of malt). You'll definitely need to avoid Malt Shoppe Cocoa, Cookies ‘n’ Crème Cocoa, and S'Mores Cocoa. However, all Stephens products are made on the same equipment, so none will be safe. Hot chocolate and hot cocoa generally don't include gluten ingredients (unless, of course, you add crumbled cookies or malt to the formula). However, the companies that make these favorite winter drinks often process them on the same equipment as other products, some of which do include gluten. Therefore, when shopping for a cup of rich, dark cocoa, you'd do best to stick with a brand like Swiss Miss or Hershey's that specifically labels its product "gluten-free." That designation means the company has done the due diligence to ensure the product is safe. Happy sipping!